Being a big fan of ELP Iwas saddened to hear that English singer, musician, songwriter, and producer Gregory Stuart “Greg” Lake tragically died on 7 December 2016 after suffering from cancer. He was born 10 November 1947 and grew up in the Parkstone area of Poole in Dorset along with Robert Fripp, who founded Progressive Rock Band King Crimson. He grew up in the residential suburb of Oakdale. At age 12, Lake first learned to play the guitar and wrote his first song, “Lucky Man”. Lake then took guitar lessons from Don Strike. Lake attended Oakdale Juniour School followed by Henry Harbin Secondary Modern School, leaving in 1963/64. He then took up work loading and unloading cargo at the Poole docks, and worked as a draughtsman before deciding to become a full time musician at age 17. Lake joined his first band, Unit Four, playing cover songs as their singer and guitarist, through 1965. When they split, Lake and Unit Four bassist Dave Genes formed another covers group, the Time Checks, until 1966. He then became a member of The Shame. Unfortunately Lake contracted pneumonia and continued to perform on stage. His band mates refused to drive back home that night, leaving Lake to sleep in the van where he “woke up blue. Following a brief stint in the Shy Limbs, by 1968 Lake was involved with The Gods, but left the group in 1968 over creative differences as the band. Robert Fripp saw Lake perform in Unit Four in Poole and When Fripp formed King Crimson, he chose Lake to be the singer and bassist and King Crimson’s very successful debut album In the Court of the Crimson King was released 1969. However During the subsequent tour, Lake met The Nice’s keyboardist Keith Emerson and left King Crimson and the pair decided to form Emerson Lake and Palmer recruiting drummer Carl Palmer of The Crazy World of Arthur Brown and Atomic Rooster to form a progressive rock supergroup, Emerson, Lake & Palmer.As well as bass, Lake contributed acoustic and electric guitar work to Emerson Lake & Palmer, and his voice had a wider and more diverse range than anything The Nice had recorded. Emerson, Lake & Palmer combined Emerson’s interest in complex, classically-influenced music and Lake’s more straightforward rock tastes. The band’s second album was entitled Tarkus, and featured the songs “Battlefield” and “From the Beginning”. Emerson, Lake & Palmer became one of the most successful groups in the 1970s. Lake picked Works Volume 1 as the “beginning of the end” of the band, as Lake did not produce their future albums, neither of which were “really innovative record”. They split in 1979 following the unsuccessful album Love Beach, an album the group were contractually obliged to record. The group reformed for a number of years in the mid-1990s before permanently disbanding barring a one-off gig in 2010. In 1975, while still a member of ELP, Greg Lake achieved solo chart success when his single, “I Believe in Father Christmas”, which has since become a Yuletide perennial. In 1981 Lake played with Gary Moore at the Reading Rock festival. The band opened with Fanfare for the Common Man, Lake playing a Kramer 8 string Bass. Moore also played his signature track Parisian Walkways. Lake briefly joined Asia in 1983, replacing fellow King Crimson member John Wetton, and then co-formed Emerson, Lake & Powell. In 2001, Lake toured as a member of the seventh incarnation of Ringo Starr & His All-Starr Band. In 2003, Lake played the bass on The Who song “Real Good Looking Boy”. In 2005, Lake toured Germany and the UK with his assembled group, the Greg Lake Ban, which included David Arch on keyboards, Florian Opahle on guitar, Trevor Barry on bass, and Brett Morgan on drums. In 2006, Lake played as a member of the supergroup The RD Crusaders in aid for charity. Lake performed “Karn Evil 9” with the Trans-Siberian Orchestra at several shows and he was a special guest on their album Night Castle (2009). In 2010, Lake and Emerson completed an acoustic world tour, performing ELP songs. In July 2010, Lake joined Emerson and Palmer for a one-off gig from Emerson, Lake & Palmer at the High Voltage Festival in Victoria Park, London, to commemorate the band’s fortieth anniversary. English musician, singer and songwriter John Ono Lennon, MBE, was tragically shot and killed by Mark Chapman in New York on 9 December 1980. John Winston Lennon was born 9 October 1940 and raised in Liverpool. As a teenager, Lennon became involved in the skiffle craze; his first band, the Quarrymen, evolved into the Beatles in 1960 and went on to become the most commercially successful and critically acclaimed act in the history of popular music and have had more number-one albums on the British charts and sold more singles in the UK than any other act. The band’s best-known lineup consisted of John Lennon, Paul McCartney, George Harrison, and Ringo Starr. Rooted in skiffle and 1950s rock and roll, the group later utilised several genres, ranging from pop ballads to psychedelic rock, often incorporating classical and other elements in innovative ways. In the early 1960s, their enormous popularity first emerged as “Beatlemania”, but as their songwriting grew in sophistication, they came to be perceived by many fans and cultural observers as an embodiment of the ideals shared by the era’s socio-cultural revolutions. They built their reputation playing clubs in Liverpool and Hamburg over a three-year period from 1960. Manager Brian Epstein moulded them into a professional act and producer George Martin enhanced their musical potential. They gained popularity in the United Kingdom after their first single, “Love Me Do”, became a modest hit in late 1962. They acquired the nickname the “Fab Four” as Beatlemania grew in Britain over the following year, and by early 1964 they had become international stars, leading the “British Invasion” of the United States pop market. From 1965 on, they produced what many critics consider their finest material, including the innovative and widely influential albums Rubber Soul (1965), Revolver (1966), Sgt. Pepper’s Lonely Hearts Club Band (1967), The Beatles (1968), and Abbey Road (1969). After their break-up of the Beatles in 1970, Lennon embarked on a solo career that produced the critically acclaimed albums John Lennon/Plastic Ono Band and Imagine, and iconic songs such as “Give Peace a Chance” and “Imagine”. Lennon revealed a rebellious nature and acerbic wit in his music, writing, drawings, on film and in interviews. He was also Controversial through his political and peace activism, he moved to New York City in 1971, where his criticism of the Vietnam War resulted in a lengthy attempt by Richard Nixon’s administration to deport him, while some of his songs were adopted as anthems by the anti-war movement.After his marriage to Yoko Ono in 1969, he changed his name to John Ono Lennon. Lennon disengaged himself from the music business in 1975 to devote time to raising his infant son Sean, (Who was also born October 9th thirty five years later in 1975)but re-emerged with Ono in 1980 with the new album Double Fantasy. Sadly though. Sadly though Lennon was tragically murdered three weeks after the release of Double Fantasy. As of 2012 Lennon’s solo album sales in the United States exceed 14 million units, and as writer, co-writer or performer, he is responsible for 25 number-one singles on the US Hot 100 chart. In 2002 a BBC poll on the 100 Greatest Britons voted him eighth, and in 2008, Rolling Stone ranked him the fifth-greatest singer of all-time. He was posthumously inducted into the Songwriters Hall of Fame in 1987 and into the Rock and Roll Hall of Fame in 1994. The Beatles topped Billboard magazine’s list of the all-time most successful Hot 100 artists In 2008, The Beatles also hold the record for most number-one hits on the Hot 100 chart with 20. They have received 7 Grammy Awards from the American National Academy of Recording Arts and Sciences, an Academy Award for Best Original Song Score and 15 Ivor Novello Awards from the British Academy of Songwriters, Composers and Authors. They were collectively included in Time magazine’s compilation of the 20th century’s 100 most influential people. French film Pioneer and innovator Georges Méliès was born December 8th 1861. After completing his education, Méliès joined the family shoe business. Later he visited London And,after visiting the Egyptian Hall, run by the famous London illusionist John Nevil Maskelyne, he developed a lifelong passion for stage magic. Méliès returned to Paris in 1885 Where he studied painting at the École des Beaux-Arts, also attending performances at the Théâtre Robert-Houdin, founded by the famous magician Jean Eugène Robert-Houdin, he tookmagic lessons from Emile Voisin. 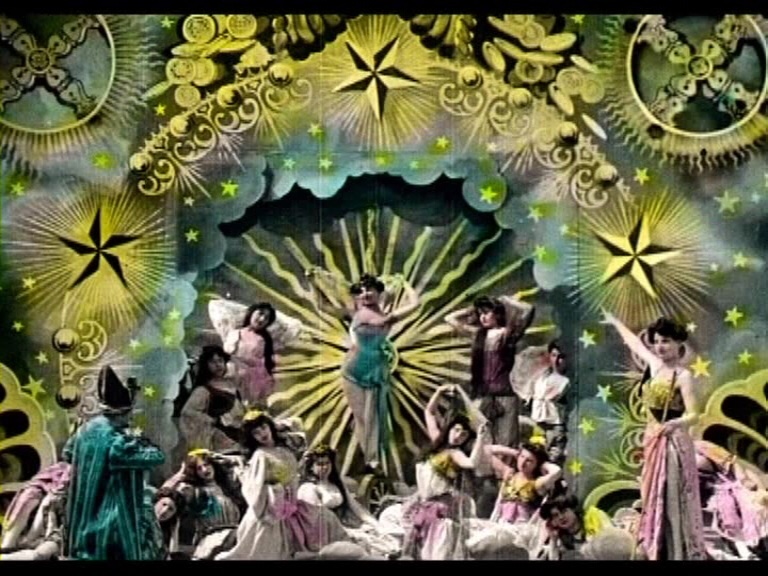 In 1888 Georges Méliès purchased the Théâtre Robert-Houdin Which was equipped with lights, levers, trapdoors, and several automata, and Over the next nine years, Méliès created over 30 new illusions including the Recalcitrant Decapitated Man, bringing comedy and melodramatic pageantry to performances which all proved popular. Méliès also worked as a political cartoonist for the liberal newspaper La Griffe. MeliesWhereas The Lumière brothers intended their invention to be used for scientific and historical study dispatching camera operators across the world to document it as ethnographic documentarians,’ Méliès’s Star-Film Company, catered for the “fairground clientele” who were intersted in magic, Art and illusion and Méliès began to experiment with special effects in his filmmaking using them in The Vanishing Lady, where a person seemed to turn into a skeleton before disappearing and then reappearing later. Then In 1896, Méliès built a film studio on his property in Montreuil, just outside of Paris. which had glass walls and ceilings so as to allow in sunlight for film exposure, and also included a shed for dressing rooms and a hangar for set construction. In 1896 Méliès made 78 films and 53 in 1897 covering every genre, including documentaries, comedies, historical reconstructions, dramas, magic tricks and féeries (fairy stories). Méliès also made advertisements for whiskey, chocolate, and baby cereal. Although he only made 30 films in 1898 his films were becoming more ambitious and elaborate, including the historical reconstruction of the sinking of the USS Maine, Divers at Work on the Wreck of the “Maine”, the magic trick film The Famous Box Trick, the féerie The Astronomer’s Dream, the religious satire TheTemptation of Saint Anthony And A Dinner Under Difficulties. He also experimented with superimposition In the films Cave of the Demons and The Four Troublesome heads, and the early horror film Cleopatra depicts her mummy being resurrected in modern times. Méliès also made The Dreyfus Affair, and Cinderella, which were popular in both Europe and The United States. At first US filmmakers such as Thomas Edison resented the competition from foreign companies & attempted to block Méliès from screening most films in the US prompting Méliès and other film makers to established a trade union Chambre Syndicale des Editeurs Cinématographiques as a way to defend themselves in foreign markets using Théâtre Robert-Houdin as the group’s headquarters. In 1900 Méliès made 33 films, including Joan of Arc, The One-Man Band and The Christmas Dream, and In 1901 Méliès made the Bus, The Brahmin and the Butterfly, Little Red Riding Hood and Bluebeard, both based on stories from Charles Perrault. In1902 Méliès made The Devil and the Statue, The Man with the Rubber Head and A Trip to the Moon, Which was loosely based on Jules Verne’s From the Earth to the Moon and H. G. Wells’ The First Men in the Moon, in which Méliès himself stars as Professor Barbenfouillis, president of the Astronomer’s Club, who oversees an expedition to the Moon where they encounter a group of Moon Men. Méliès also produced three other films The Coronation of Edward VII, using actual footage of the carriage procession in the film, Gulliver’s Travels, based on the novel by Jonathan Swift and Robinson Crusoe, based on the novel by Daniel Defoe. 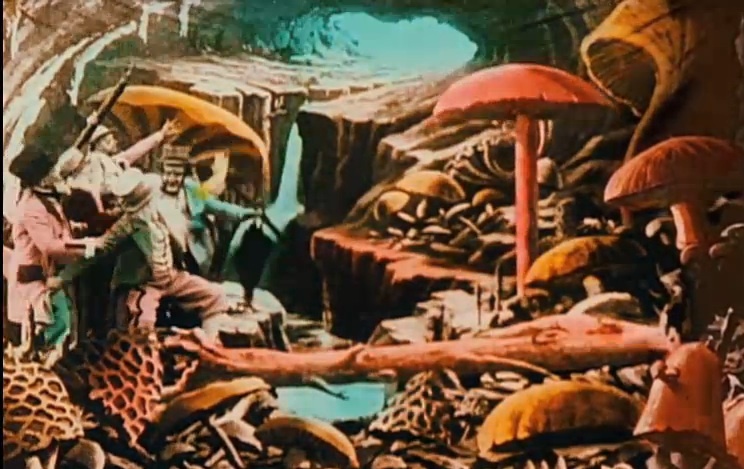 In 1903 Méliès made Fairyland: A Kingdom of Fairies, Ten Ladies in one Umbrella, The Melomaniac and Faust in Hell, based on the opera by Berlioz, and In 1904 he made a sequel, Faust and Marguerite. based on an opera by Charles Gounod, the Barber of Seville and The Impossible Voyage Which was about an expedition around the world, into the oceans and even to the sun. Méliès also create a special effects film for a theatre revue, entitled The Adventurous Automobile Trip. In 1905 Méliès contributed two short films to The Merry Deeds of Satan : The Space Trip and The Cyclone, and also made The Palace of Arabian Knights and the féerie Rip’s Dream for the 100th birthday of Jean Eugène Robert-Houdin. in 1906, he made a film version of The Merry Deeds of Satan and The Witch. In 1907 Méliès made nineteen films, including a parody of Jules Verne’s 20,000 Leagues Under the Sea and a short version of Hamlet and in 1908 Méliès made one of his most ambitious films: Humanity Through the Ages, which retells the history of humans from Cain and Abel to the Hague Peace Conference of 1907. Méliès made three films in 1909 and In 1910 his brother Gaston set up a studio called the Star Films Ranch in Texas, where he began to produce Westerns. By 1911 Gaston had renamed his branch of Star Films American Wildwest Productions & produced over 130 films between 1910 and 1912. Between 1910 and 1912, Georges Méliès produced 20 films including Whimsical Illusions and Spiritualist Phenomena.The Adventures of Baron Munchausen and The Haunted Window & In 1912, Méliès made Conquest of the Pole, inspired by Robert Peary’s expedition to the North Pole in 1909 and Roald Amundsen’s expedition to the South Pole in 1911. This included giant monsters and also has elements of Jules Verne’s The Adventures of Captain Hatteras he also made The Snow Knight and Le Voyage de la famille Bourrichon. Sadly in the autumn of 1910, Méliès made a fateful deal with Charles Pathé that would eventually destroy his film career, whereby he accepted a large amount of money to produce films while Pathé Frères distributed and reserved the right to edit these films, and also held the deeds to both Méliès’s home and his Montreuil studio as part of the deal. Later he also started having financial trouble thanks to his brother Gaston’s poor financial decisions, and he lost $50,000 and was forced to sell the American branch of Star Films to Vitagraph Studios. As a result Méliès was unable to pay the money he owed Pathé thus breaking the contract and he was declared bankrupt and stopped making films. the Théâtre Robert-Houdin was shut down for a year and Méliès left Paris for several years. In 1917 the French army turned the main studio building at his Montreuil studio into a hospital for wounded soldiers. He and his family then turned the second studio set into a theatrical stage and performed over 24 variety show revues there until 1923 when it was torn down in order to rebuild the Bouvevard Haussmann. The French army also confiscated over 400 of the original prints of Star-Films’s catalog of films in order to melt them down and retrieve their celluloid and silver content. The final straw came In 1923, when Pathé took over Star-Films and the Montreuil studio. And In a rage, Méliès personally burned all of the negatives of his films that he had stored at the Montreuil studio, as well as most of the sets and costumes. As a result many of his films do not exist today. Nonetheless, just over 200 Méliès films have been preserved and are available on DVD. After being driven out of business, Méliès disappeared from public life. By the mid-1920s he was making a meager living as a candy and toy salesman at the Montparnasse station in Paris. However in 1920s several journalists began to research Méliès and his life’s work, creating new interest in him. As his prestige began to grow in the film world, he was given more recognition and in December 1929 a gala retrospective of his work was held at the Salle Pleyel. Eventually Georges Méliès was awarded the Légion d’honneur (Legion of Honor) which was presented to him in 1931 by Louis Lumière. Lumière himself said that Méliès was the “creator of the cinematic spectacle. In 1932, the Cinema Society arranged a place for Méliès, his granddaughter Madeleine and Jeanne d’Alcy at La Maison du Retrait du Cinéma, the film industry’s retirement home in Orly, where Méliès worked with several younger directors on scripts for films including a new version of Baron Münchhausen with Hans Richter and a film called Le Fantôme du métro (Phantom of the Metro) In his later years. He also acted in a few advertisements . In 1936 an abandoned building was rented on the property of the Orly retirement home to store the collection of film prints. They then entrusted the key to the building to Méliès and he became the first conservator of what would eventually become the Cinémathèque Française. Although he was never able to make another film after 1913 or stage another theatrical performance after 1923, he continued to draw, write and advise younger film and theatrical admirers until the end of his life. By late 1937 Méliès had become very ill and he was admitted to the Léopold Bellan Hospital in Paris. one of Méliès last drawings was of a champagne bottle with the cork popped and bubbling over. Méliès died of cancer on 21 January 1938 just hours after the passing of Émile Cohl, another great French film pioneer, and was buried in the Père Lachaise Cemetery. In 1922, Rivera participated in the founding of the Revolutionary Union of Technical Workers, Painters and Sculptors, and also joined the Mexican Communist Party . His murals, subsequently painted in fresco only, dealt with Mexican society and reflected the country’s 1910 Revolution. Rivera developed his own native style based on large, simplified figures and bold colors with an Aztec influence clearly present in murals at the Secretariat of Public Education in Mexico City.In the autumn of 1927, Rivera arrived in Moscow, to take part in the celebration of the 10th anniversary of the October Revolution & painted a mural for the Red Army Club in Moscow, but in 1928 he was expelled and returned to Mexico where he was expelled from the Mexican Communist Party too. Between 1922 and 1953, Rivera painted murals in Mexico City, Chapingo, Cuernavaca, San Francisco, Detroit, and New York City. In 1931, a retrospective exhibition of his works was also held at the Museum of Modern Art in New York City. Rivera”s radical political beliefs, attacks on the church and clergy made him a controversial figure even in communist circles. His mural Man at the Crossroads, for the Rockefeller Center in New York City, was removed after a furor erupted in the press over a portrait of Vladimir Lenin it contained. As a result of the negative publicity, a further commission to paint a mural for an exhibition at the Chicago World’s Fair was canceled. In December 1933, Rivera returned to Mexico, & repainted Man at the Crossroads in the Palacio de Bellas Artes in Mexico City. In 1940, Rivera returned for the last time to the US to paint a ten-panel mural for the Golden Gate International Exposition in San Francisco & The mural and its archives reside at City College of San Francisco. As well as having some controversial political views Diego Rivera was also an atheist who considered religions to be a form of collective neurosis. and some of his work caused a big fuss particularly his mural Dreams of a Sunday in the Alameda depicted Ignacio Ramírez holding a sign which read, “God does not exist”. 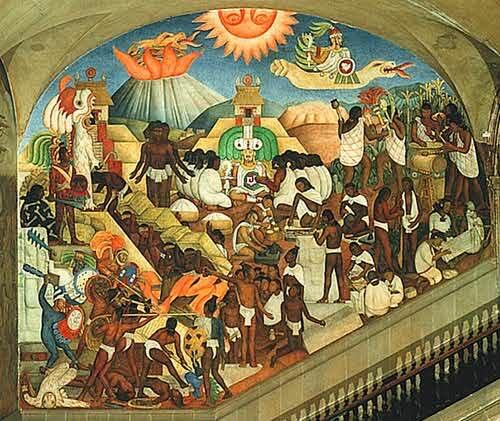 This painting was not shown for 9 years – until Rivera agreed to remove the inscription. He stated: “To affirm ‘God does not exist’, I do not have to hide behind Don Ignacio Ramírez .” Sadly Rivera eventually passed away on November 24 in 1957. Phil Collen, the guitarist with Heavy Matal band Def Leppard was born December 8th 1957. Def Leppard were Formed in 1977 in Sheffield as part of the New Wave of British Heavy Metal movement. Def Leppard ’s strongest commercial success came between the early 1980s and the early 1990s. Their 1981 album High ‘n’ Dry was produced by Robert John “Mutt” Lange, who helped them begin to define their style, and the album’s stand out track “Bringin’ On the Heartbreak” became one of the first metal videos played on MTV in 1982. The band’s next studio album Pyromania in 1983, contained the singles Photograph and Rock of Ages, and turned Def Leppard into a household name. In 2004, the album ranked number 384 on Rolling Stone’s 500 Greatest Albums of All Time. 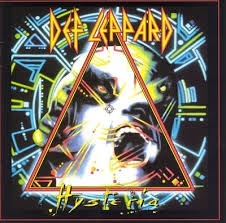 Def Leppard’s Classic fourth album Hysteria, was released in 1987, this topped the U.S and UK album charts. As of 2009 it has 12x platinum sales in the United States, and has gone on to sell over 20 million copies worldwide. The album contained loads of great songs, including the U.S. Billboard Hot 100 number one “Love Bites”, alongside Pour Some Sugar on Me , “Hysteria”,Armaggeddon It , “Animal” Rocket“., Gods of War and Women. Def Leppard’s next studio album Adrenalize reached number one on the U.S. Billboard 200 and UK Album Chart in 1992, this contained several hits including, “Let’s Get Rocked” and “Have You Ever Needed Someone So Bad”. The follow up was the 1993 album Retro Active which contained the acoustic hit song “Two Steps Behind”, while their greatest hits album Vault released in 1995, this featured the track “When Love & Hate Collide. Def Leppard’s latest album “Def Leppard” was released in 2015 with a limited edition Fan Pack containing a magazine, A4 Posters of the band and a Keyring. It contains the songs Let’s Go, Dangerous, Man Enough, We Belong, Invincible, Sea of Love, Energized, All Time High, Battle of My own, Broke’n Brokenhearted, Forever Young, Last Dance, Wings of an Angel and Blind Faith plus two alternative Mixes of We Belong and Let’s Go. Best known as the lead singer and lyricist of the rock band The Doors, TheAmerican musician, singer, and poet James Douglas “Jim” Morrison was born December 8, 1943. 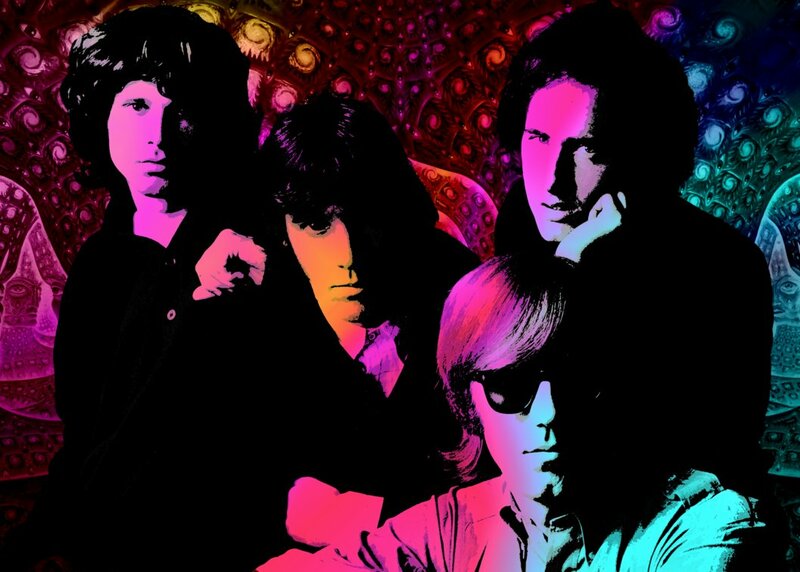 The Doors were formed In the summer of 1965, when, after graduating from the UCLA. Morrison and fellow UCLA student Ray Manzarek formed the group during that same Summer of 1965. after meeingt months earlier as fellow cinematography students. Thereafter, drummer John Densmore and guitarist Robby Krieger auditioned and was then added to the lineup. All three musicians shared a common interest in the Maharishi Mahesh Yogi’s meditation practices at the time, attending scheduled classes, but Morrison was not involved in this series of classes, claiming later that he “did not meditate”. The Doors took their name from the title of Aldous Huxley’s book The Doors of Perception (a reference to the “unlocking” of “doors of perception” through psychedelic drug use). Huxley’s own title was a quotation from William Blake’s The Marriage of Heaven and Hell, in which Blake wrote: “If the doors of perception were cleansed everything would appear to man as it is, infinite.”The Doors achieved national recognition after signing with Elektra Records in 1967. The single “Light My Fire” spent three weeks at number one on the Billboard Hot 100 chart in July/August 1967.Later, The Doors appeared on The Ed Sullivan Show, a popular Sunday night variety series that had introduced The Beatles and Elvis Presley to the United States. Ed Sullivan requested two songs from The Doors for the show, “People Are Strange”, and “Light My Fire”. Morrison began writing during his adolescence. At UCLA he studied the related fields of theater, film, and cinematography.He self-published two separate volumes of his poetry in 1969, entitled The Lords / Notes on Vision and The New Creatures. The Lords consists primarily of brief descriptions of places, people, events and Morrison’s thoughts on cinema., but The New Creatures verses are more poetic in tone.Jim Morrison’s vocal influences included Elvis Presley and Frank Sinatra, which is evident in his own baritone crooning style used in several of The Doors songs. It is mentioned that Morrison as a teenager was such a fan of Presley’s music that he demanded people be quiet when Elvis was on the radio. The Frank Sinatra influence is mentioned in the pages of “The Doors, The Illustrated History”, where Frank Sinatra is listed on Morrison’s Band Bio as being his favorite singer. Morrison was also well-known for often improvising spoken word poetry passages while the band played live.